Did you miss out earlier this week when we told you that the best-selling Bluetooth earbuds on Amazon’s entire site are currently on sale at their lowest price ever? Don’t worry because you still have time to get in on the action. 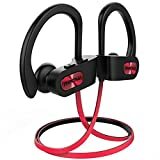 Join the nearly 5,000 BGR Deals readers who have used this exclusive coupon code BGRFLAME8 to get the Mpow Flame Bluetooth Headphones for just $15.99, an all-time low. They feature great sound, solid battery life, and class-leading IPX7 water-resistance so you don’t have to worry about sweat from a workout or even a quick dunk if you drop them into water!